I have been an ordained Lutheran pastor in the Lutheran Church - Missouri Synod since 1987. I have also served as a fire chaplain since 2003. In the church-at-large I serve my district as a District Secretary and was previously a Circuit Visitor from 2006-2018 (equivalent to a rural dean). Each summer I teach an online course in homiletics for Concordia Theological Seminary in Ft. Wayne. Regina Angelorum - Queen of Angels? Pope Revises Limbo - What Does That Mean? A Place for Humor in Church and Pulpit? On the night before the mass of the Resurrection of Our Lord, the church historically observed a vigil service at which the newly catechized were baptized. Lutheran Worship made an effort to restore this ancient practice to the LCMS, at least through its agenda rite in the early 80's. I experienced my first vigil at my home church in Wausau, Wisconsin not long before my graduation from the seminary in 1987. It was introduced by Dr. John Brunner, who is now president of the Eastern District. He was also the first to wear a chasuble in that parish, as I remember. I did not participate in another vigil until my last parish in Traverse City, Michigan, another larger church. Dr. Charles Gieschen was the senior pastor of that parish who not only taught me again how to do the liturgy (according to Harry Krieger specifications! ), but opened to me a rich liturgical heritage in a beautiful church edifice. Processing into a darkened sanctuary, led by the newly lit Pascal Candle, I can still hear the chant: "The light of Christ!" as it was repeated all the way to the altar. We were not always successful in arranging to have children to be baptized, but the readings and emphasis of the service was still on this blessed sacrament, which has such close and intimate ties to the Resurrection. The historic shape of the baptismal font reveals this in itself. With eight sides it brings us again to the new creation. Here what was dead in sin is made new again in the risen Christ. The image lost in the Fall is being restored again in the person of God's Son in whom our lives are hid. Creation's decline into chaos and destruction and death is reversed in the new day of re-creation in Christ, the first fruits of all who will rise from the dead on the last day when He returns again in glory in the company of the angelic hosts. As we anticipate the glorious celebration of his resurrection tomorrow, it is good to remember how that resurrection is made real in our own baptisms. For here we were buried with Christ unto death, but raised again to newness of life. Living out our baptisms we die daily to sin through repentance, and we rise victorious in Christ as forgiven and restored children of the Father. A blessed vigil to all. My congregation (Immanuel Lutheran Church in Valparaiso, Indiana) has a vigil early on Easter morning that precedes the Easter service. 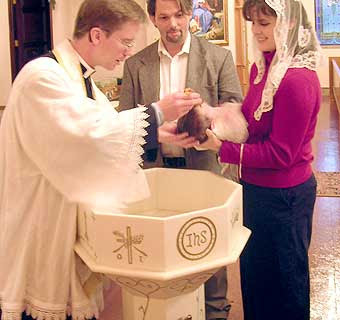 We usually have at least one baptism each year but we also have several affirmations of baptism for new members of the church who are either from different denominations or who had left the church ( I can't remember if the whole church is little "c" or big "C" so let's just say the body of Christ). Afterwards the entire congregation is invited to come to the font and affirm their own baptism. It's a very moving experience. After the vigil, the lights are brought up and the actual Easter service begins with the singing "This is the feast of victory for our God." I really enjoy having the two services flow into each other and experiencing the transition from darkness to light beginning with the paschal candle and ending with the sunrise. Since Immanuel is my first and only church (I have only been Lutheran for about 3 years now) I had assumed that the Easter vigil was part of every congregation. I think everyone should experience the vigil at some point, it really captures the depth of what Easter is about and how its themes are echoed throughout the Old Testament.